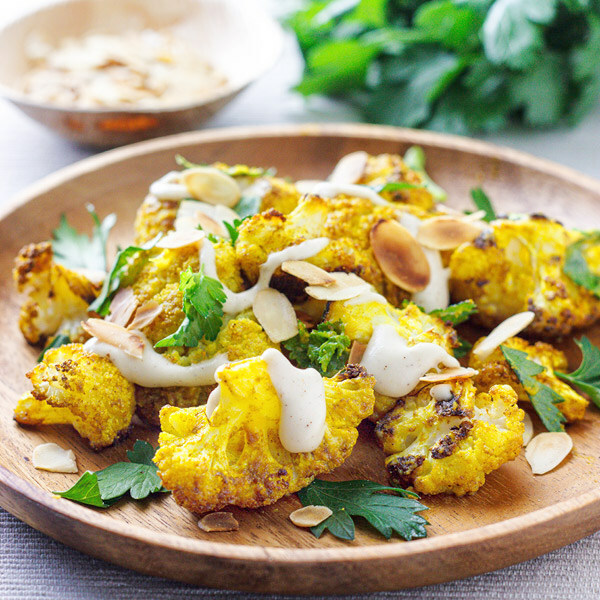 Here the humble cauliflower is transformed into a glorious, golden, seriously addictive feast with the addition of spices and lemony tahini sauce, freshened up with parsley leaves and woody crunch from toasted almond flakes. It works well with lamb, as you’d expect from all these Middle Eastern flavours but, frankly, it stands up so well by itself that I usually serve it alone as lunch or a light supper. Roasting cauliflower will unleash its sulphurous smell, which you can neutralise with a bowl of plain white vinegar placed somewhere near your oven. Works like a charm. Cut out the cauliflower’s core, snap into forkable florets and place in a roomy bowl. Drizzle over the olive oil and toss gently until well coated. Add the cumin, coriander and turmeric. Toss again, using a utensil to avoid yellow-stained hands. Tip onto a rimmed baking sheet, giving the florets some space, and slide into the oven for 40–45 minutes, until cooked through and beginning to brown. Meanwhile, make the dressing. Using the same bowl, mix the tahini paste and lemon juice together. It will both split and thicken at first; just keep beating until it comes together smoothly. Add 1 tablespoon of water, and adjust to give it the consistency of thin mayonnaise (if it is too thick, the cauliflower will break apart when you dress it). Season with a pinch of salt and a pinch of cumin. Taste: there should be a good balance of sesame and lemon, so adjust as necessary. When the cauliflower is cooked, carefully tip into the dressing and toss gently. Add the parsley leaves and most of the almonds, tossing again, being careful to not break it up too much. Finish with the remaining toasted almonds.